Thank you for a Great Parade! The Quantico Marine Corp Band entertaining the crowd before the #GWParade begins. 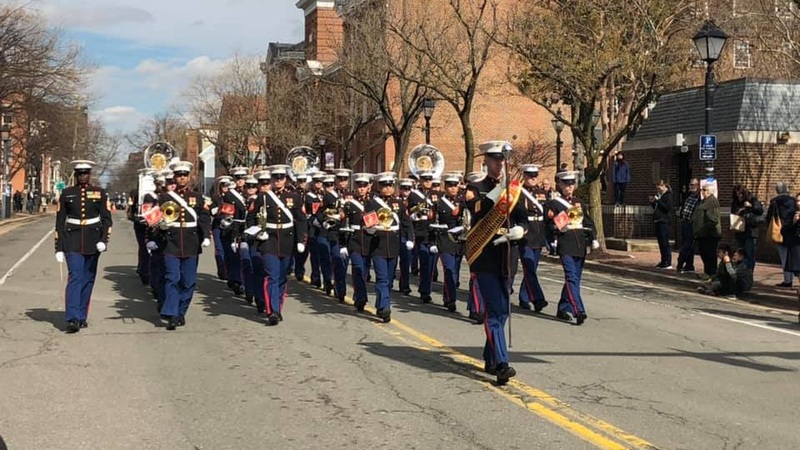 This is a big -- no HUGE -- thank you to everyone who made happen the 2019 George Washington Birthday Parade on Monday, February 18. We have been doing the Parade for a long time, but every year is a new adventure. We lost a few big units just before kick off, gained some more new marshals when we needed them badly, ran a very successful experiment with dignitary vehicles, and welcomed back some units from long ago. Best of all, with all the rain on one side and snow coming to the other side, we really dodged a bullet and had very nice weather (we can't make any mistakes when we have good weather!). There are so many people to thank that I can't do it all at once. New successes: the "Hunt for Washington" treasure hunt (more than 100 participants! ), the Caribbean Cruisers Car Club who stepped up with their beautiful cars and carried most of the dignitaries in the Parade, and brand new caterers for the post-Parade reception (Randy Peaches and Marilyn Patterson). Sad goodbyes: to Tracy Foust who has been doing our sound since the eighties (headed for New Orleans). Special honorable mentions to the Quantico Marine Band (awesome!) and Ourisman Dodge & Alexandria Toyota dealerships for loaning us some very special parade vehicles. I hope to see everyone next year: February 17, 2020; register parade units and volunteer after Labor Day! Mark your calendars now!! Please follow up and keep in touch (send us ideas, compliments, suggestions) and visit us (all our meetings are open to the public) third Monday of the month at the GW Memorial, but check the City Calendar to make sure. Despite the fact that every commercial or department store sale references the more generic name, in fact, the name has never officially been changed since it was officially declared a holiday in 1885. You can read a recent description of the debate that was posted last year on WhiteHouse.gov, but Joe Shumard, co-chair of the GW Birthday Celebration Committee, best remembers an explanation of “Why Today is Not ‘Presidents’ Day” written by James C. Rees, long time Executive Director of Mount Vernon who passed away in 2014. You can click here to download a PDF of the article that appears below. And next time you hear someone reference “Presidents’ Day,” you can share this important information! Every February, thousands of shopping malls and car dealerships should be accused of false advertising during their massive “Presidents’ Day” sales. This annual holiday is not “Presidents’ Day.” Officially, it is the national tribute to only one president – George Washington. Declared a legal holiday by the federal government in 1885, George Washington’s Birthday has culturally morphed into “Presidents’ Day.” Even the so-called authority on American holidays, The American Book of Days, has it wrong. In 1968, the “Monday Holiday Law” was enacted by the United States Congress to provide for uniform annual observances of public holidays. 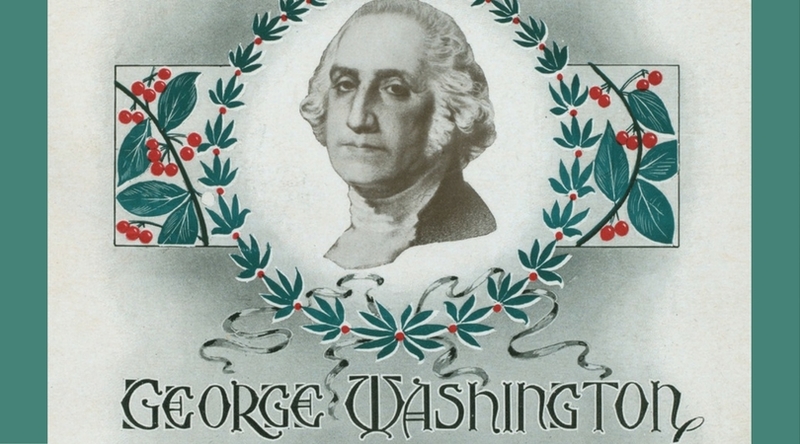 George Washington’s Birthday was slated to be recognized on the third Monday in February. The law was enacted in 1971, yet popular culture has perpetuated the myth that the holiday was designated to honor presidential officeholders in general. Officially, however, the holiday has never changed. Nor should it. To lump Washington together with the 42 other men who have been elected president in this country does not assign him the significance he deserves. The only president to be elected unanimously – and it happened to him twice – Washington essentially shaped the office of the president. With tremendous foresight, he knew that his actions would set important precedents, and he conscientiously labored over many of his decisions. Unlike modern presidents, Washington did not conduct polls to determine what steps to take. Instead, he asked the same question, over and over again: “What is the best course for America?” His instincts were seldom wrong, and his patriotism never faltered. Washington once said, “I can never resist the call of my country,” and he responded to his country’s needs time and time again. Washington’s critical role as commander in chief during the Revolutionary War, his refusal to become king when others called for it, his chairmanship of the Constitutional Convention, his ability to hold the nation together and remain neutral during European conflicts, and his wise and steady influence during the nascent development of the new republic – these are just some of the reasons why Washington, The Father of His Country, should be given singular attention. George Washington was said to be “first in war, first in peace, and first in the hearts of his countrymen.” Unfortunately, that oft-repeated quote, originally proclaimed by Henry Lee at one of the hundreds of memorial services to George Washington, is not as ubiquitous as it once was. Schools no longer feature portraits of Washington in their classrooms, and children grow up with the vague notion that Washington was a great man, but they are unable to articulate why. We have a long road to travel to reverse this disturbing trend. A good place to start is by returning “Presidents’ Day” to its rightful name and purpose. On this day that is set aside to honor George Washington, Americans should re-discover why he was so crucial to the founding of this nation. They should talk to their children about his renowned character and virtues. Families should plan trips to Mount Vernon and other historic places where Washington lived and worked. And most of all, Americans should shed their indifference and be grateful for the man who led this remarkable nation to freedom. And wouldn’t it be refreshing if families postponed their trips to the mall to gather around the dinner table to talk about George Washington and the other Founding Fathers. That linen sale will still be there tomorrow, so don’t be bashful – have that second slice of cherry pie. It has been 110 days since we started posting the Rules of Civility and Decent Behaviour In Company and Conversation written by George Washington in his youth. If you have been keeping up with our Facebook posts since the beginning or just joining, I thank you for your time and support. Just because our daily lessons are ending doesn’t mean we are done. There are plenty of events that you are welcomed and encourage to attend throughout George Washington Month and we would love to hear from back from you. It is important to remind ourselves that these maxims helped mold the behavior and actions of General Washington and served him well throughout his life, and in turn, served our country. Washington was idolized for many reasons, with his character and virtues being on display for all to see, hear and critique. Yet, even people who disliked Washington had great words to say. Thomas Jefferson, who wrote a letter to Walter Jones in 1814 (see the link below), and was on unfriendly terms with Washington in the last decade of the 18th century, described the General’s character in length as he knew him: “...his integrity was most pure, his justice the most inflexible I have ever known, no motives of interest or consanguinity, of friendship or hatred, being able to bias his decision. he was indeed, in every sense of the words, a wise, a good, & a great man”. Many people could dismiss these writings as being outdated, but it is hard to argue against the messages behind them. They instill a sense of humanity; that we should be willing to make some sacrifices for the welfare and harmony of living together. By proclaiming our respect for others, and by living these maxims, we will come to a greater sense of harmony within the community, state and nation, just like Washington lived and acted. GWBCC’s Summer “Walking with Washington” Tours Were a Great Success! On July 21 and August 18, volunteers from the GW Birthday Celebration Committee hosted almost 70 visitors for free guided tours of George Washington's hometown of Old Towne, Alexandria. In July, the tour continued with more than two dozen people despite a massive rainstorm. Those who came in August enjoyed nicer weather, but both tours were able to enjoy great stories about the life and time of our first President's experiences in the town he considered home. Tour attendees learned about significant people and events in Washington’s life and in American history, with stops at the William Ramsay House, Market Square, the Carlyle House (where General Edward Braddock planned campaigns for the French and Indian War), Wise’s Tavern (where Mayor Dennis Ramsey coined the term “Mr. President”), Duvall House/Tavern, Gadsby’s Tavern (where proprietor John Gadsby hosted Washington's last birthday ball in 1799), Washington’s Townhouse, the Lord Fairfax House, “Light-Horse” Harry Lee’s house, and Christ Church (where Washington worshipped). The tours were so successful that the Committee is announcing plans to add two Fall Walking with Walking Tours in September and October. Stay tuned for information on those tour dates soon! GWBCC is pleased to announce summer versions of our popular "Walking With Washington Tour." Explore important sites associated with George Washington in his hometown of Alexandria! This guided walking tour of historic Old Towne covers significant people and events in Washington’s life and in American history, with stops at the William Ramsay House, Market Square, the Carlyle House, Wise’s Tavern, Duvall House/Tavern, Gadsby’s Tavern, Washington’s townhouse, the Lord Fairfax House, “Light-Horse” Harry Lee’s house, and Christ Church. Announcing the Winners of the Tenth Annual #GWCherryChallenge! On Saturday, February 24, 2018, from 1 - 4 p.m., please join us for the 2018 George Washington Birthday Symposium at the George Washington Masonic National Memorial. 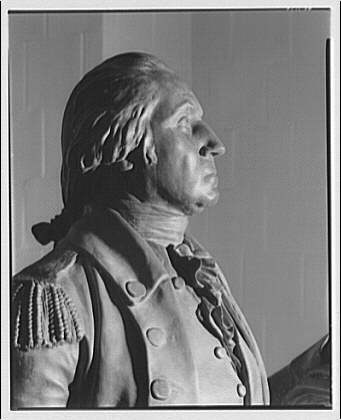 The George Washington Symposium is held annually on Washington’s Birthday to provide the public with contemporary research on the life of George Washington. Mark A. Tabbert, the Memorial’s Director of Collections, serves as the Symposium’s Master of Ceremonies. Admission is free, but registration is requested. Please REGISTER HERE!! For the whole list of birthday events, including a reception, concert, and a banquet, please click here! Register now for the #GWCherryChallenge! On behalf of the GW Birthday Celebration Committee, we are inviting all Alexandria area restaurants to register for the 2018 Cherry Challenge! As you know from your participation last year, this event is designed to generate buzz for Alexandria restaurants, boost customer traffic, encourage chefs to get creative and excited about their special offerings, and enable us to offer a tasteful event that keeps George Washington's memory alive in his hometown! In the words of one participant, "The GW Cherry Challenge is fun, fun, fun. Our customers love it!" To participate, all you need to do is create and serve one or more menu items that include CHERRIES. You may use fresh cherries, dried cherries, canned cherries…whatever form you desire. Categories are Beverage, Appetizer, Entree, and Dessert. You will feature your creation(s) from JANUARY 28 through FEBRUARY 11, 2018. For more information, please review this flyer. Last year, the Cherry Challenge reached 40+ participating restaurants! As you know, we promote the contest through social media (specifically Facebook and Twitter) just prior to the first day of the campaign and running through the duration of the campaign. We are so grateful for the support of Alexandria restaurant community and we want to make this event meaningful for all the establishments that participate. Walk through a historic camp and participate in tactical demonstrations on Sunday, February 18, 2018 from 10 a.m. to 2 p.m. Then witness a Revolutionary War skirmish between the Redcoats and Colonial Army at 2:00 p.m. at Ft. Ward Museum & Historic Site (4301 W Braddock Road, Alexandria, VA 22304) FREE! Special parking is available on Braddock Road between North Howard Road and Marlboro Drive (look for signage); public parking will not be available in the park. In the spirit of the old cherry tree tale, we challenge Alexandria restaurants to a very CHERRY culinary contest! VISIT participating restaurants and enjoy cherry-themed drinks, starters, entrees and desserts. VOTE for your favorite cherry challenge item, rating the taste, creativity, and presentation of the dish. Submit your ballot on location. SHARE your experience by posting pictures of your feast on Twitter, Facebook, and Instagram with the hashtag #gwcherrychallenge! Winners will be announced on our website! George Washington gets a new Webpage! The George Washington Birthday Celebration Committee has invested in a new website! Peruse our streamlined content and explore the many ways in which you can attend or support our Race, Parade, and partnered programming throughout the year. Share your suggestions for improvement by leaving a comment below. We look forward to your thoughts!